In this tutorial, I’ll demonstrate how to implement self-destructing messages in a chatroom built using Chatkit and React. For those unaware, the messages will self-destruct after a particular duration set by the user, leaving no trace of it in the chatroom or on Chatkit servers. You need to have Node.js (v8 or later) and npm installed to complete this tutorial. You can check out this page to view instructions on how to install or upgrade Node.js on your machine. Prior experience with building React and Node applications is also necessary to grasp the concepts discussed in this tutorial. Open this link to create a new Chatkit account or sign in to your existing account. This is a necessary step so that you can create a new Chatkit instance for your application and manage your credentials. Once you’re logged in, create a new Chatkit instance for your application, then locate the Credentials tab on your instance’s dashboard and take note of the Instance Locator and Secret Key as we’ll be using them later on. Head over to the Console tab, and create a new user and a new room. You can follow the instructions on this page to learn how to do so. Take note of the room ID as we’ll be using it later on. 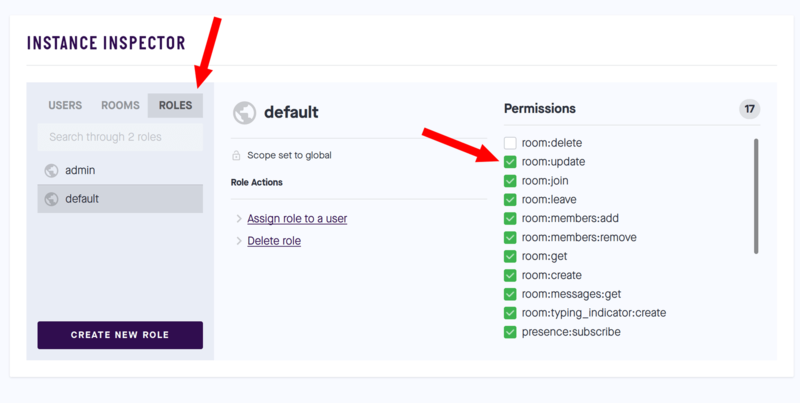 Finally, head over to the ROLES tab and update the permissions under the default role to include room:update. This role needs to be enabled for users to be able to update the room as you’ll see later on as we progress. Next, run the command below to install the dependencies we’ll be needing to build the server. . The [@pusher/chatkit-server](https://www.npmjs.com/package/@pusher/chatkit-server) package is the Node.js SDK that grants us the ability to make use of Chatkit features on the server. At the moment, we have two routes on the server. The /users endpoint is where user creation takes place, while the /authenticate endpoint is used to authenticate any user before they can gain access. For the sake of brevity, I have opted not to include a proper authentication flow in this example. That’s all we need to do on the server for now. You can start the server by running node server.js to make it available on port 5200. Once all the dependencies have been installed, run npm start from within the client folder to launch the development server on http://localhost:3000.
placeholder="Compose your message and hit ENTER to send"
Don’t forget to update <your instance locator> and <your room id> with the appropriate details from your Chatkit instance dashboard. When a user tries to join the chat, the addUser() method connects to your Chatkit instance and returns a currentUser object that represents the current connected user. This object is the primary means of interacting with Chatkit. After this, the connectToRoom() method is invoked. This method connects the user to the room whose ID was provided, and loads the last 100 messages from that room into the application. The messageLimit property controls how many messages can be loaded at once. When we subscribe to a room, we can take advantage of the room subscription hooks to perform actions whenever something happens in the room. These hooks are defined in the aptly named hooks object. The onMessage hook is triggered when a new message is sent to the chatroom. 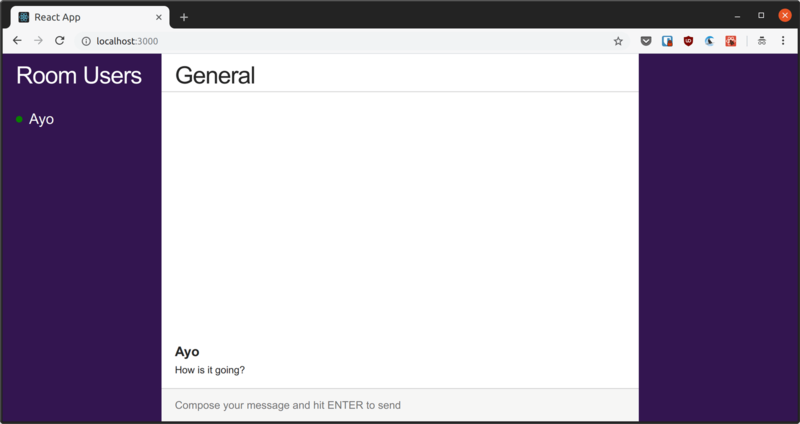 We simply append the message to the messages array and render it in the chat window. Similarly, the onPresenceChanged hook is fired when a member of the room comes online or goes offline so that we can show the correct status of the users in the sidebar and update it immediately a change happens. At this point, you should be able to add a user to the room and view the user’s online or offline status in the sidebar. 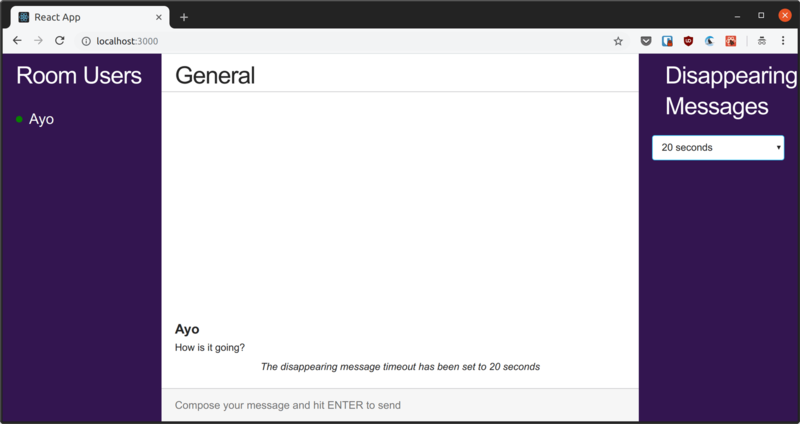 To send a message to the chatroom, all we need to do is call currentUser.sendMessage() and pass in the message as well as the id of the room where the message is to be sent. And now to the headline feature of this project. We will create an interface for the user to opt into self-destruct mode, and also select the amount of time before messages are destroyed. We’ll also show a status message across all connected clients whenever the self-destruct status is changed. Whenever the self-destruct timer is updated, we update the room in updateMessageTime() and pass the current value of messageTimer to using the customData property which allows us to associate custom data with a room. In addUser(), we updated the connect() method to include the connection hooks object which allows us to be notified when various events happen on the Chatkit instance. The onRoomUpdated hook is fired when a room is updated. In this case, we’re simply displaying a message in the chat window that indicates the current self-destruct status. To actually delete a message, we need to set up a route on the server that takes the ID of the message to delete. Then we will use setTimeout() to execute the deletion after the specified period of time. Once the message has been deleted from the room, Chatkit updates the message with a generic ‘DELETED’ text, and the onMessage hook will be triggered again. Instead of adding the deleted message again, we’ll just find the message in the messages array and simply update it to it’s latest value. Before you test the app, make sure to kill the server with Ctrl-C and start it again using node server.js. And don’t forget to update <your instance locator> and <your room id> in App.js with the appropriate details from your Chatkit instance dashboard. That concludes my tutorial. You can checkout other things Chatkit can do by viewing its extensive documentation. Don't forget to grab the complete source code in this GitHub repository.